I’m not doing too bad. I have to admit completely stopping smoking was not possible, since I am around smokers all the time. Incredible, how many backpackers smoke, concerning that they should be on low money all the time and saving for tours, petrol or flights. But I have reduced it a lot. There were times when I went through a pack a day, thats 25 Pall Mall cigarettes a day. Now a pack lasts a more than a week, I still have maybe one or two cigarettes a day. When I go out and drink, it is even more difficult, kind’a not surprising. But I’m not drinking as much as I used to. I go out maybe twice a week, that helps the fact that I m still trying to quit smoking. So I ll keep you updated on how I m going. I m sure I ll make progress, just give me some time. I m working heaps at the moment. This week I only have one day off, which is today. 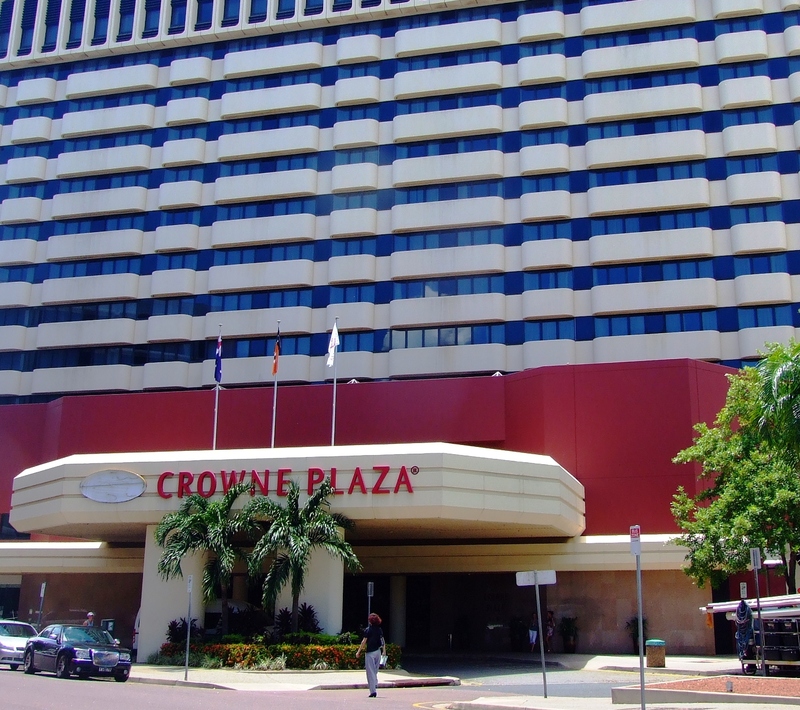 Working for the Crowne Plaza is great though, time runs by so quickly and I enjoy working in a hotel and dealing with hotel customers all day. My workmates are awesome, I can hardly describe how great it is to be part of the team here. I have never seen such a nice bunch of people working together, and I have worked in all sorts of places before. Some of you might have realised that I have uploaded some more pictures on my flickr-website. Almost 1000 pictures were uploaded this month, so have a look around and enjoy. I will go through a few recent uploads, so you know how to find them. I stayed in Sydney in October 2009 for two days and also in February 2010 for one week. Simply click on the picture above to get to my pictures from Sydney. 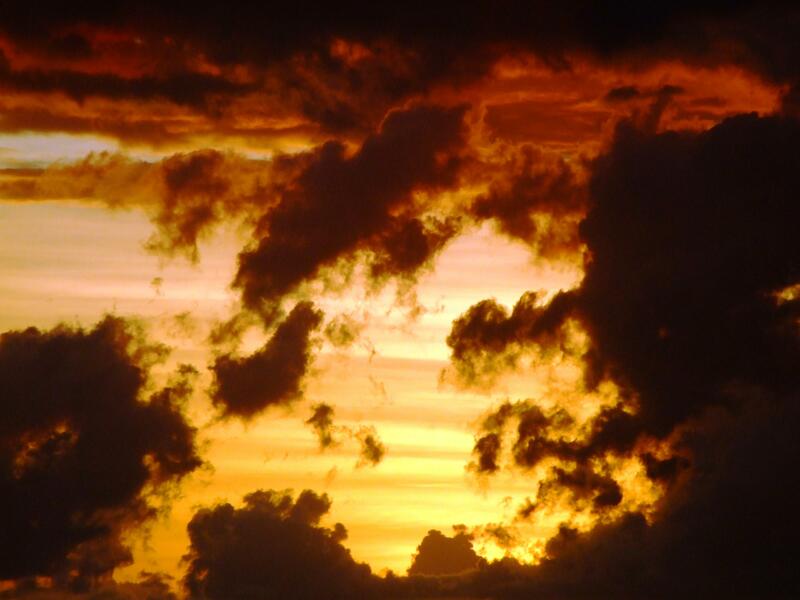 To see the pictures from one of the most beautiful places in the world and also probably the place in the world where it rains the most (more than 8.000 mm per year), simply click on the picture above, the newest pictures are on page three to five. This place is also quite a nasty location. If you don’t get wet, you will definitely get eaten by sandflies. Start eating a sandwich outside and you’ll be surrounded by dozens of those little flies within seconds. There are not many pictures of Shanghai on my website, because I only had a couple of hours in the city. My flight from Frankfurt landed just after lunchtime and I was flying out again at 7.20pm. Only because of the MAGLEV, the fast magnetic transrapid train, which does 431 km/h I was able to actually have a look at one of the city centers. Some more pictures from Whitianga. These ones were taken in the time between November 2009 and January 2010 when I worked in Whitianga as a bartender, chef and waiter at Wild Hogs Bar and Restaurant. Same procedure – click on the picture, the newest pictures are on page ten to twelve in the album. I will keep uploading pictures, but I always load them up in a strictly chronological order. So you have to wait for pictures of Darwin until the rest of what I did before Darwin is online. Shouldn’t be too long anyway. 67 posts I have published, all of them in german. This is post number 68 and it is the first one in english. Welcome to http://www.zapletan.com, all my australian friends and bro’s from New Zealand! Great to have you here keeping in touch with what I am up to. 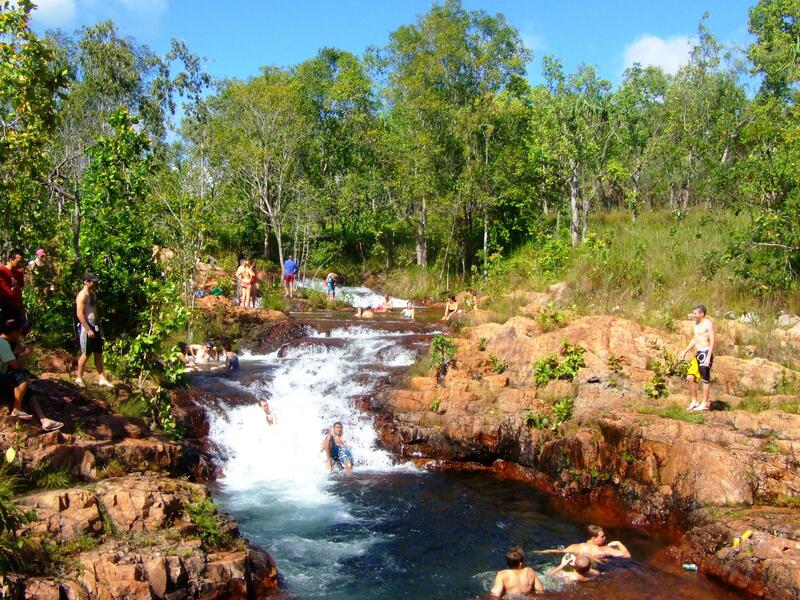 My first post will be about Litchfield National Park, one of the most spectacular places if you end up spendind time in Darwin. It was about 6.50 when the bus picked me up outside my hostel. I was still tired of course, since I went to bed at around 3 am. So I hopped on the bus and fell asleep before we even left Darwin. I have no idea how long it took us to get down to Litchfield since I slept all the way, but by the time we got there I was right awake. 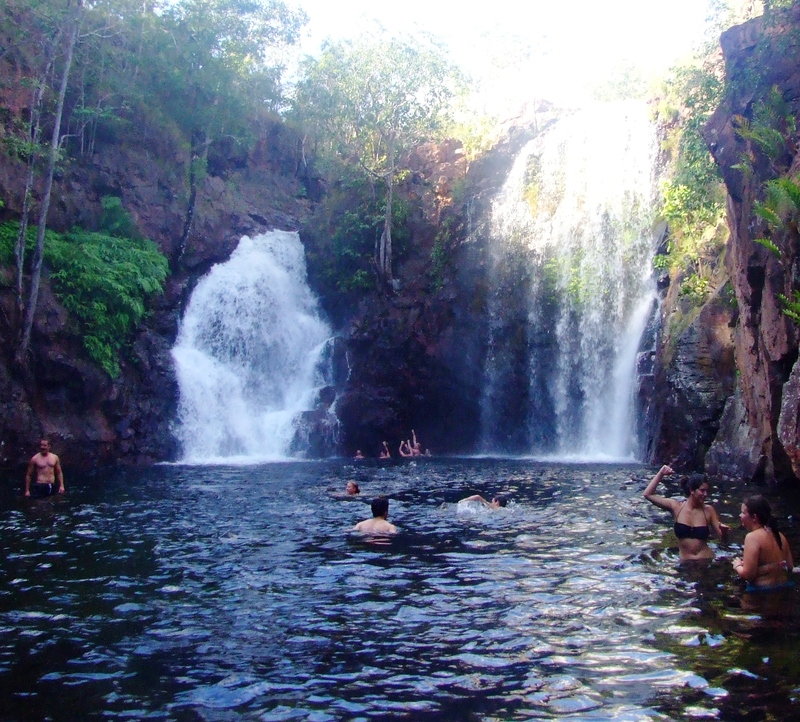 The first stop was Florence Falls, where we stopped for about one hour and had the chance to go for a swim. A huge waterfall with a nice swimming area below, full of fish and crystal clear water. After we have all had a swim down there we proceeded to the Buley Blowholes, an area within a single creek creating different swimmingholes while making its way downstream. 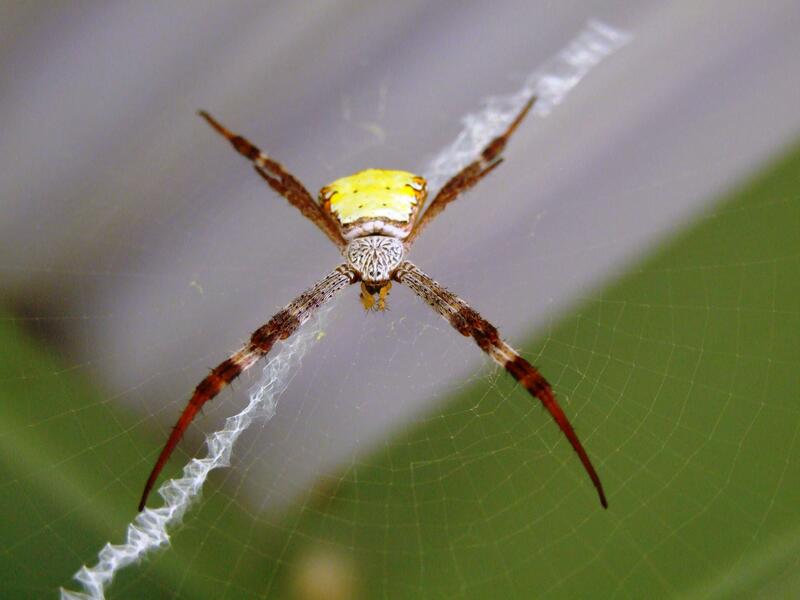 We stayed at Wangi Falls for about an hour and found some interesting spiders in the shelter. I forgot what this one is called, but it is quite pretty and it is about the size of a matchbox. 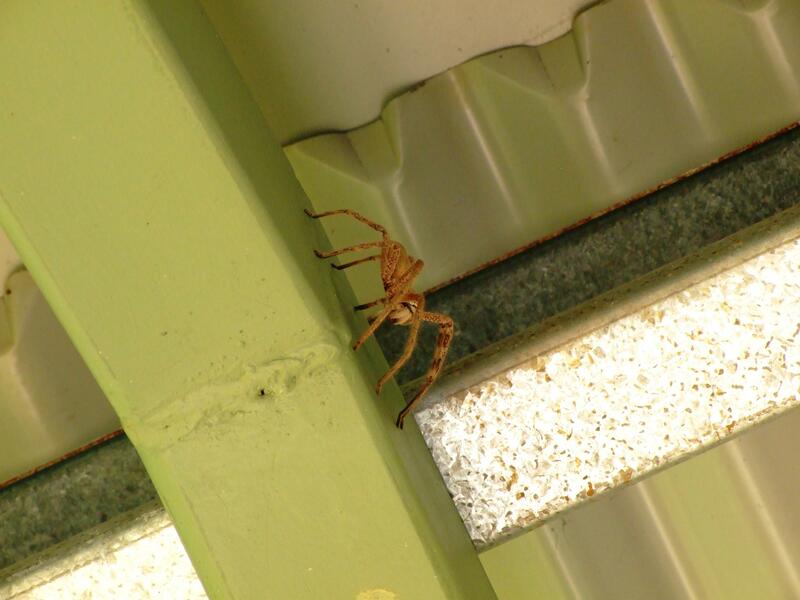 They call this one a Huntsman spider (Sparassidae), a species that can get a legspan of up to 30 cm. Their bite is not toxic but can cause some serious pain, inflammation or even irregular pulse. It is however considered to be peaceful unless attacked, so we were safe looking at it and taking pictures of it from a safe distance. 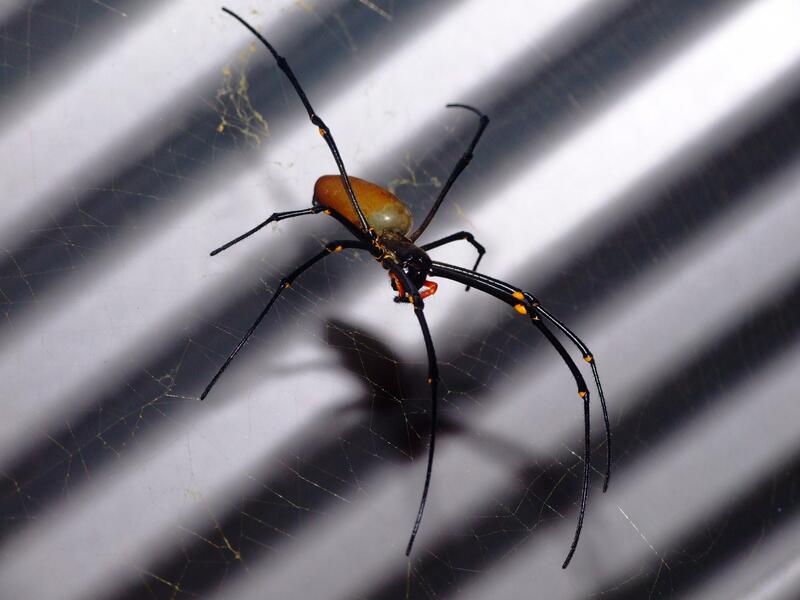 And then we saw the red-legged golden orb-web spider (Nephila inaurata) which creates webs that even catch little birds or bats. This species is more common in South Africa or the Indian Ocean but can also be found in Australia. This particular spider was about the size of an adult’s hand, so roughly about 300 mm long and 150 mm wide. Click on the picture to get a close-up view on it. After seeing all those huge insects we continued to see some huge reptiles. 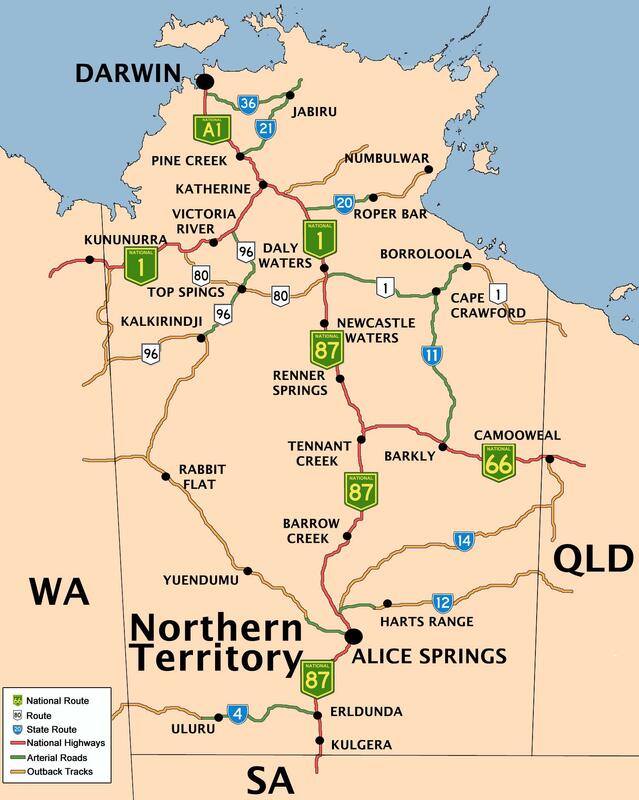 Our bus tour continued from deep in the heart of Litchfield National Park back towards Darwin, past Humpty Doo to Adelaide River. 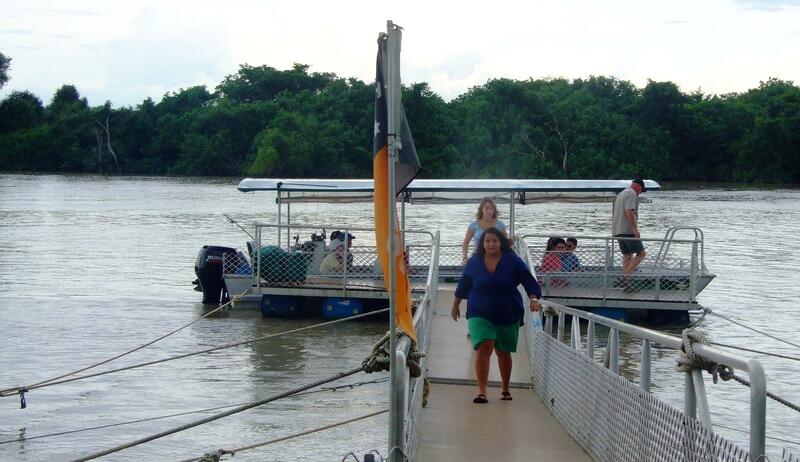 Most tour companies, like TopendEscapes or AATKings use the local Jumping Crocodile Cruise to send their guests to, whereas Wallaroo Tours have their own property next to the river, and they own their own boat – which is the smallest operating the Jumping Crocodile Cruise… and that means you get a lot closer to the crocs than with anyone else! This one is a female saltwate crocodile, about three metres long, trying to catch the meat on the rod, but it was probably the smallest and least aggressive one that we saw on Adelaide river this afternoon. It didnt take long until Barry, our tour guide, identified one of the males that ruled the area of this part of the river. When you see those wild reptiles less than a metre in front of you, almost five metres long, and jumping out of the water about two metres high, you feel the fear and respect that these animals deserve. Those crocodiles are believed to be about 200 million years old whereas dinosaurs became extinct about 65 million years ago. 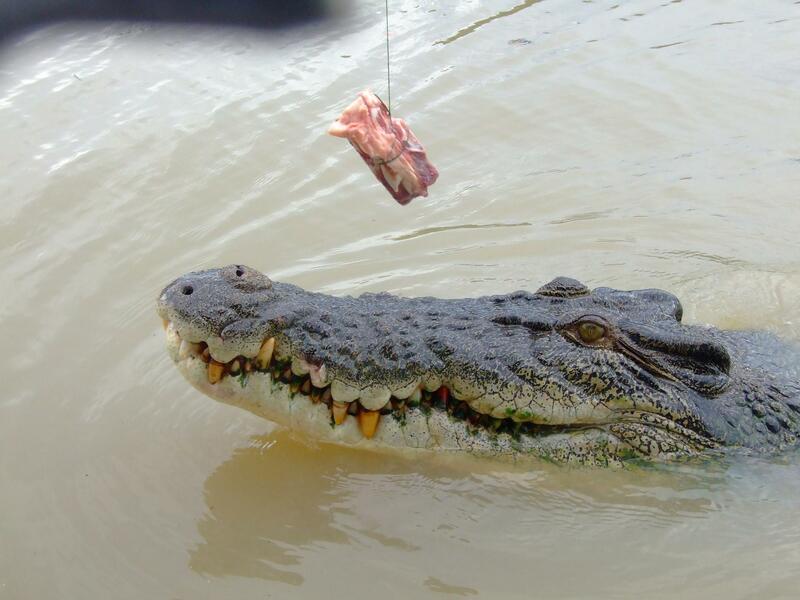 You have to remember – whatever killed the dinosaurs did not kill the crocodiles, they are excellent survivors. 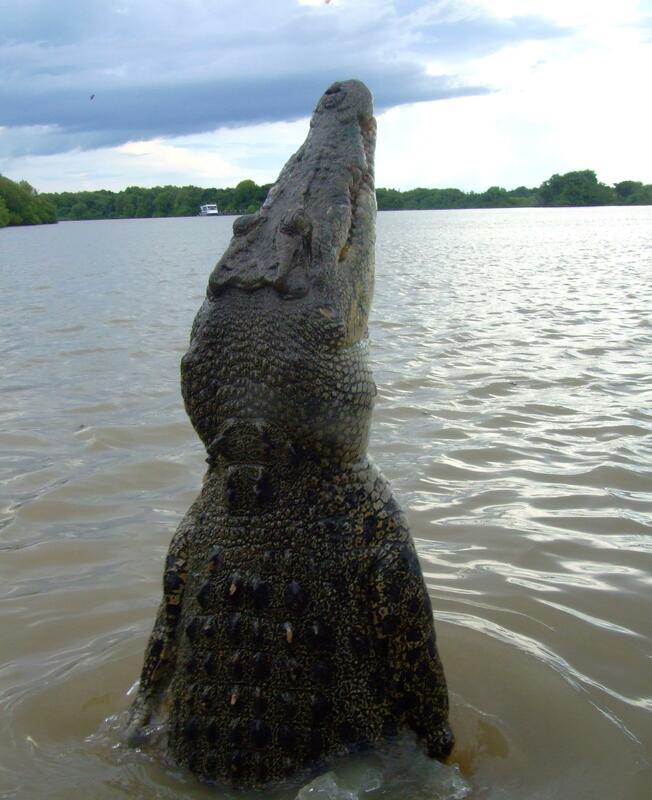 The largest crocodile ever sighted was more than seven metres long and weighed probably more than 2,000 kgs. When you see these huge creatures in action, there is one thing that comes to your mind straight away… stay away! They would love you to be part of their food chain! 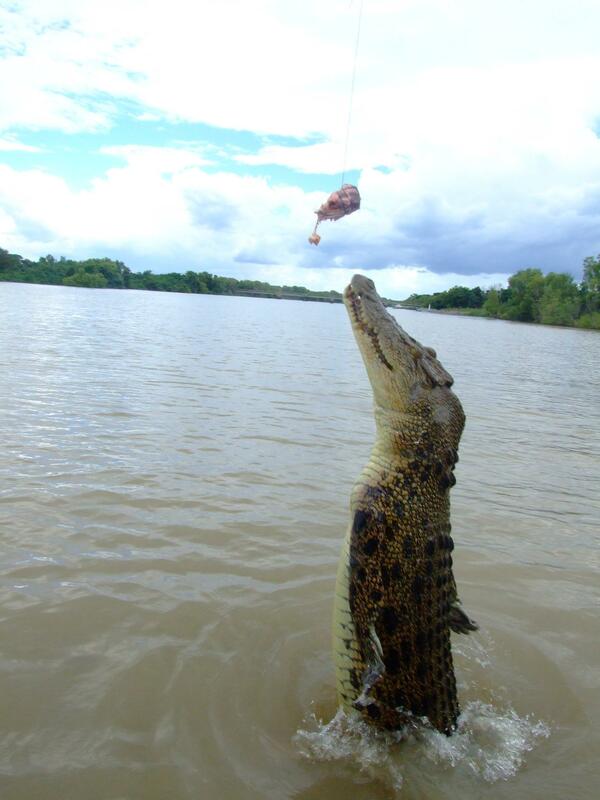 This male crocodile leaps out of the water about 1,5 metres since it is hungry and wants to be fed. 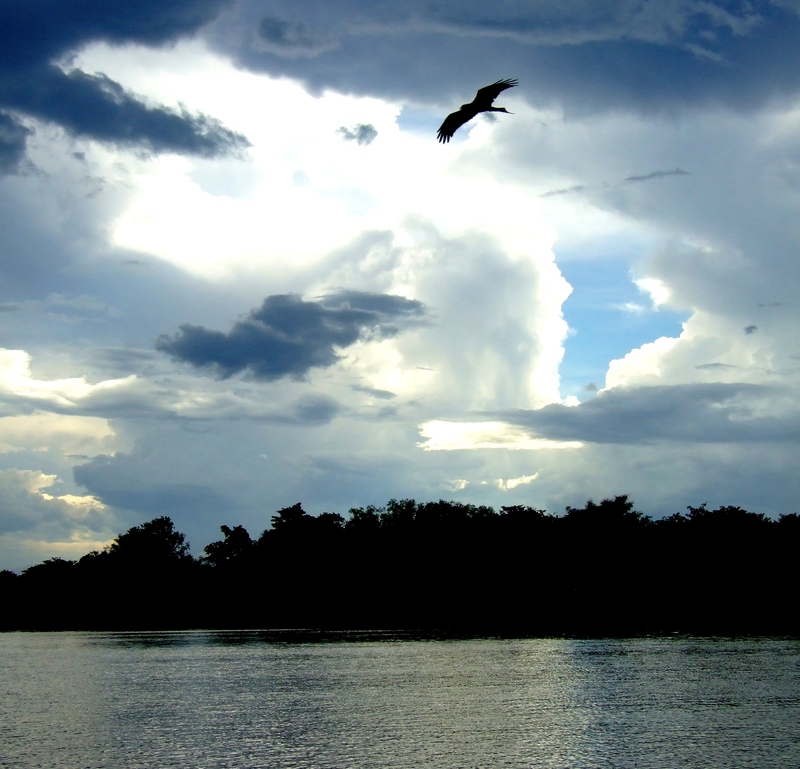 An eagle above Adelaive River, the habitat of more than 3,000 saltwater crocodiles which would all be more than happy to nibble on one of the 1 million curious tourists that come across the top end of Australia every year. After spending more than an hour on the river, getting close-up pictures of huge saltwater crocodiles we made our way back to Darwin. 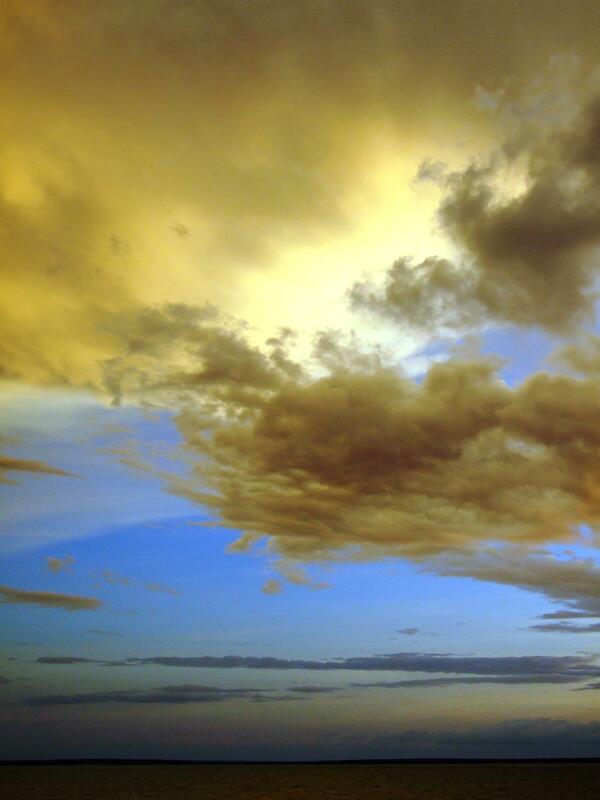 The bus headed straight to East Point in Darwin to be back in time for the sunset around 7 pm. 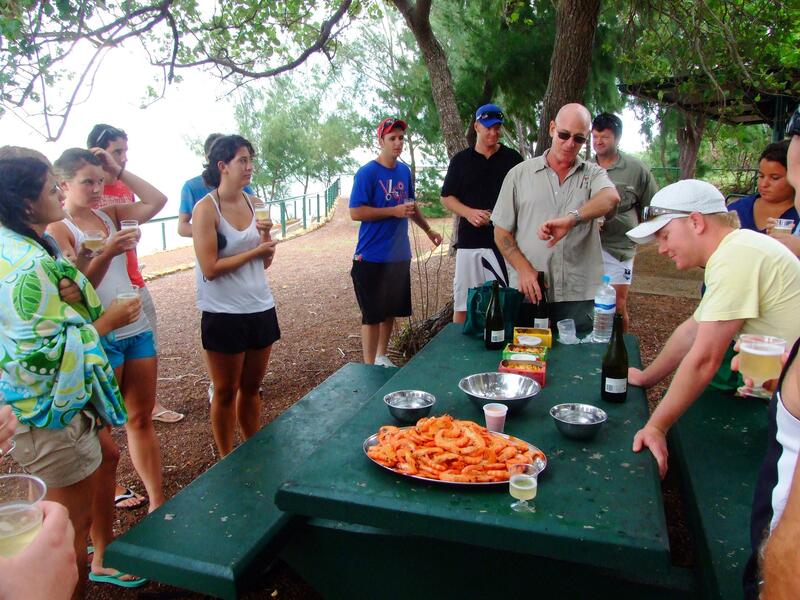 The conclusion of the day was Champaign and Prawns while we watched a magnificient sunset over the bay and reflected our experiences of the day. 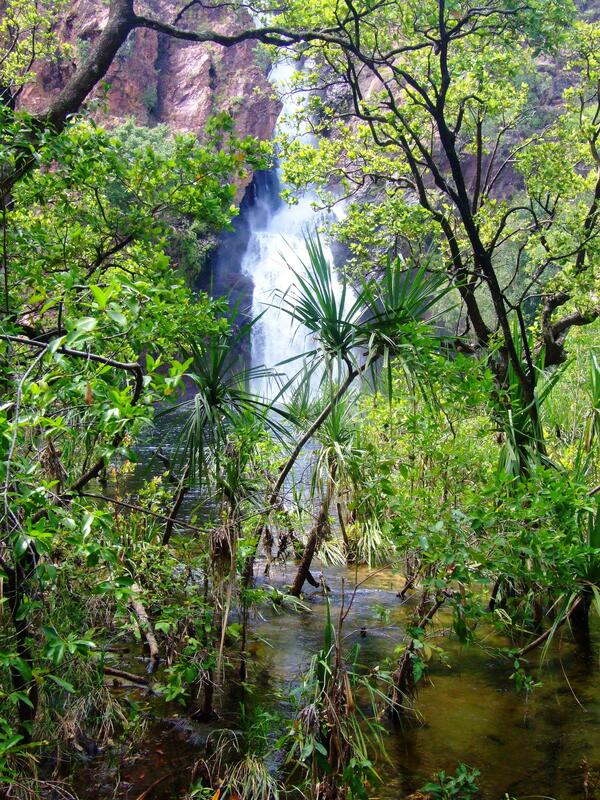 Everyone was still speechless from the beautiful waterfalls in Litchfield and the giant crocodiles in Adelaide River. Wallarroo Tours dropped everyone back at their place of accomodation at around 7.30pm, after such an interesting and long 12-hour-day of seeing waterfalls, spiders, birds, crocodiles and the beauty of the Northern Territory of Australia. Many thanks to Barry, our tour guide, bus driver, boat captain and crocodile expert. And thanks for reading all of this. Bevor ich nun Details von meinem neuen Auto preisgebe, das ja eigentlich schon gar nicht mehr neu ist, da ich es sei Mitte Februar besitze, möchte ich kurz ein paar Worte in eigener Sache loswerden. Fast genau ein Jahr lang gibt es diesen Blog jetzt und ich freue mich über meine regelmäßigen Leser und ihre Kommentare, dazu gehören auf jeden Fall mein Vater, mein Bruder sowie meine besten Freunde Roman aus Hamburg, Niko aus Münster, Lutz aus Düsseldorf, und dann sind da noch der Norman aus Hamburg, der Fabian aus Pforzheim, der Michael aus Pforzheim, und falls ich jemanden vergessen habe, bitte nehmt es mir nicht übel – dankeschön für’s Lesen und für die netten Kommentare. Aber ab sofort wird es eine besondere Umstellung geben. Dies ist der letzte Artikel auf Deutsch. Ab sofort werden alle Artikel auf Englisch erscheinen, denn ich habe in Neuseeland, in Australien und in ein paar anderen nicht-deutschsprachigen Ländern in den letzten Monaten Menschen kennengelernt, die auch Freunde geworden sind, und auch gerne etwas in diesem Blog verstehen würden. Heute, am 5. April 2010, bin ich exakt eineinhalb Jahre unterwegs – 18 Monate voller Eindrücke, Menschen, Emotionen. Ich hoffe ihr freut euch dank dieses Blogs genauso wie ich auf die kommenden Monate der Berichterstattung von der Südhalbkugel. Ich verspreche weiterhin abenteuerliche Geschichten und mitreißende Fotos und werde mich bemühen, regelmäßiger zu bloggen. Eigentlich wollte ich mir ja noch kein Auto kaufen. Aber das Angebot war einfach so gut, da musste ich zuschlagen. Ich war mir immer nicht sicher, ob ich mir einen Van kaufen soll, in dem ich schlafen kann, bzw. ich und eine weibliche Reisebegleitung – da muss eine große Matratze ja reinpassen. 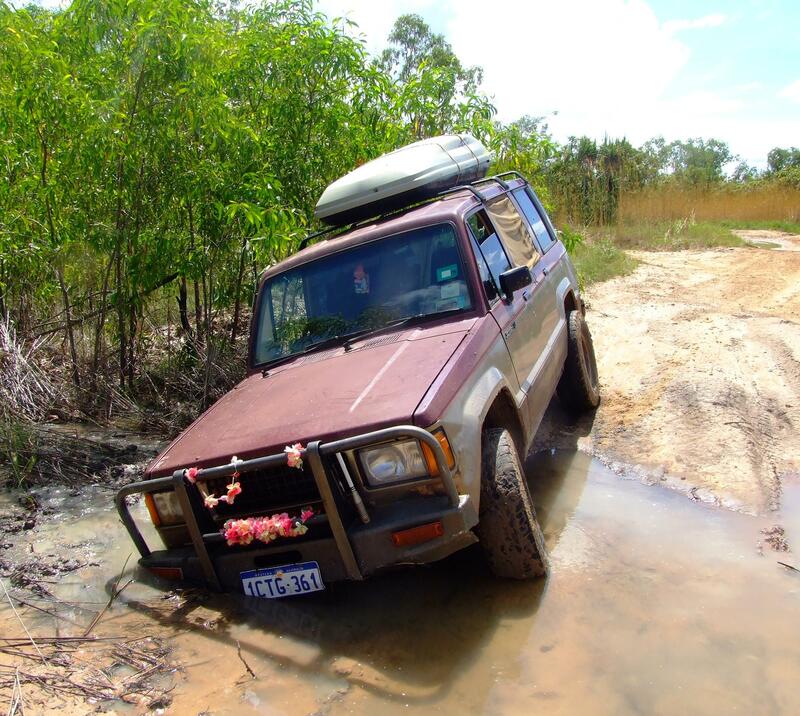 Oder sollte ich mir lieber einen Allradjeep zulegen, die Straßen sind ja nicht überall optimal hier, und man will ja mal über den “Tellerrand” hinaus schauen und sich die wilde Natur des Outbacks ansehen. “Now…. we have to start digging…” schlug ich vor. Also rein in den Matsch. Bei etwa 34 Grad im Schatten knieten wir uns in den Schlick vor die rechten Reifen und fingen an zu buddeln. Doch der weiche treibsandartige Matsch sank sofort nach, es dauerte ewig, den Reifen überhaupt sichtbar zu machen. Vorne so schlimm wie hinten. Die gesamte rechte Seite saß komplett im Schlick. Ich kletterte wieder ins Auto, natürlich durch die Beifahrertür, sonst wäre die ganze Suppe in den Fußraum gelaufen. Vorwärts, Rückwärts, das Fahrzeug bewegte sich keinen Zentimeter. Die Räder drehten durch und gruben sich wieder zurück in den Schlamm. “Do you want to go back to the Highway and ask for help?”, fragte ich Hannah. Also zog sie los, Richtung Highway, der zum Glück nur 10 Minuten zu Fuß entfernt war. Immer ein Auge auf den nahegelegenen Bach, in dem sich Krokodile befinden könnten. Ich buddelte weiter, aber die Situation war auswegslos. Ich war schon von oben bis unten voller Schlamm und Schweiß, als mir auffiel, wie schwachsinnig das Buddeln doch war. Und ich setzte mich auf einen Stein, zündete mir eine Zigarette an und schaute mir das Dilemma aus einigen Meter Abstand ein. Wenn man keine Probleme hat, dann macht man sich welche, dachte ich mir. Da musste ich erstmal eine Weile lachen. Dann kam Hannah zurück und hatte einen Australier mitgebracht. Der kam sofort mit seinem Toyota Hilux um die Ecke und war zuverlässig, dass sein drei-Liter-Motor meine Karre rausziehen würde. Ich krabbelte zurück auf den Fahrersitz, legte den Rückwärtsgang ein und gab Gas, während er versuchte, mich rauszuziehen. Noch bevor der Wagen sich auch nur ansatzweise bewegte, gab es einen lauten Knall. Ich krabbelte wieder über den Beifahrersitz aus dem Auto raus, um zu sehen, was passiert war. Das Seil war gerissen. “I have had that one for years!”, schimpfte der Australier. Nun ja, es mag Jahre gehalten haben, aber ich habe mein Auto auch schön tief eingebuddelt. Zweiter Versuch, diesmal mit kürzerem Seil. Wieder gab es einen Knall und das Seil war gerissen. Sein Auto würde nicht genug Kraft haben, meinte der nette Australier zu uns, er schlug vor uns mit nach Palmerston zu nehmen, wo wir beim 4WD-Center Hilfe kriegen würden. Er nahm uns mit zurück Richtung Palmerston, den Wagen ließ ich abgeschlossen im Sumpf zurück. Die Wertsachen habe ich natürlich mitgenommen. Man glaubt nicht, wieviele Idioten da auch tagsüber unterwegs sind und herrenlose Autos aufbrechen. In Palmerston beim 4WD-Center kam uns die gleiche Freundlichkeit entgegen, die wir schon bei dem anderen Australier erlebt hatten. Sofort ging der nette Mann, der etwa 65 war, zu seinem Toyota Landcruiser. 4,2 Liter Turbodiesel. Mit dem Auto hätte er bis jetzt jeden rausgezogen, meinte er zu uns. Er sei aber auch schon mal selbst steckengeblieben. Positiv denken, dachte ich mir. Wir kamen also zurück zum Auto, es war noch alles dran und keine Scheiben waren eingebrochen. Die Sorge, dass der Wagen weiter einsinken würde, blieb auch unbestätigt. 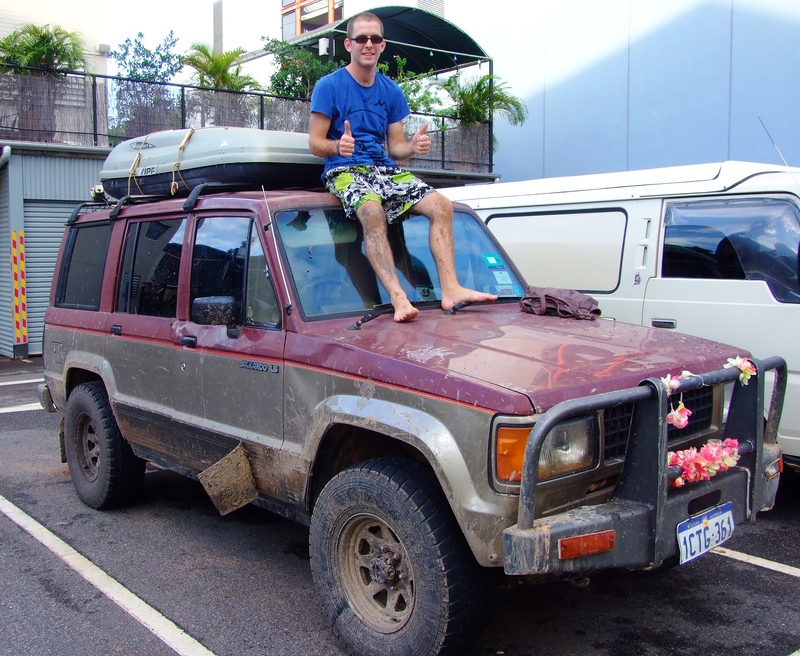 “Tink”, der nette Mann vom 4WD-Laden, platzierte seinen Landcruiser diesmal vor meinem Jackaroo und wollte diesen vorwärts aus dem Dreck ziehen. Das Seil riss zwar nicht, aber wieder liess es einen lauten Knall und der komplette Abschlepphaken vorne an meinem Auto flog quer über den Sand und haute eine ordentliche Delle in den Bullbar von seinem Landcruiser. Wäre das Ding einen Meter höher geflogen, hätte es ihm die Windschutzscheibe zerhauen und vielleicht eine tödliche Beule verpasst. Jetzt wurde es ernst. Wie kriegen wir das Auto nur da raus? Er sah ein, dass die Idee mit dem vorwärts rausziehen nicht besonders gut war und platzierte sich hinter meinem Auto, mit einem Abschleppseil, dass er schon seit 23 Jahren hatte. Ich gab vorsichtig im zweiten Gang Gas und das Auto bewegte sich sogar, da gab es wieder einen Knall und auch das Seil, dass seit 1987 seinen Dienst getan hatt, riss und ließ mein Auto im Sand sitzen. “Tink” hat dann die ultimative Lösung in Anspruch genommen. Die Seilwinde am Bug seines Autos. Er kettete das Stahlseil an meine Anhängerkupplung und holte es ein, bis es straff war. Dann fuhr er langsam rückwärts und zu meiner Überraschung bewegte sich das Auto, zum ersten Mal seit Stunden. Etwa eine Minute lang bewegte sich mein zwei Tonnen schweres gefährt äußerst langsam durch den Schlick, dann gab es einen ordentlichen Ruck und ich war draußen. Fester Untergrund. Ich schrie vor Freude. Im Rückspiegel sah ich Hannah applaudieren. Sofort sprang ich aus dem Auto und schüttelte Tink’s Hand. Wir waren frei und ich hatte mein Auto wieder. Bis zum nächsten Mal – ab dann auf Englisch…. So ziemlich genau einen Monat ist es nun her, dass ich das letzte mal etwas gebloggt habe. Das ist nicht so oft, wie ich es euch mal versprochen hatte, andererseits ist auch nicht so viel spannendes passiert. Langweilig war es auch nicht, aber ich möchte euch ja nicht immer nur über meinen australischen Alltag erzählen. Und genau zwei Monate ist es her, dass ich nach Australien geflogen bin. Damals bin ich von Auckland in Neuseeland nach Sydney geflogen, wo ich eine Woche verbracht hatte, bevor ich nach Darwin geflogen bin. Die Entscheidung nach Darwin war einfach aus dem Bauch heraus. Mich hat das tropische Klima gelockt und die Tatsache, dass Darwin eine isolierte Kleinstadt mit 100.000 Einwohnern ist. 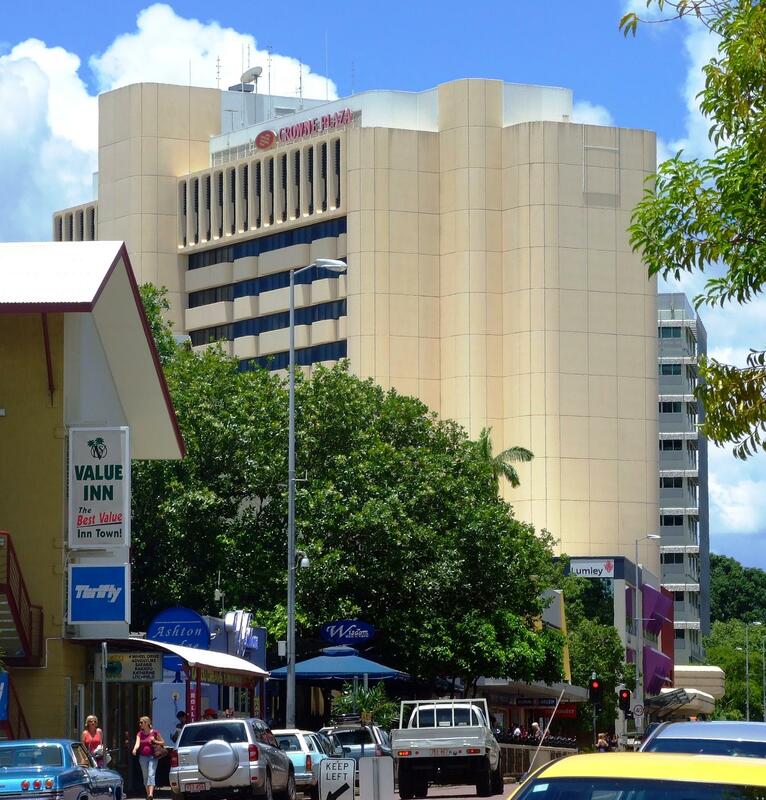 Da bin ich nun, in Darwin und ich habe seit fünf Wochen den Job als Concierge im Crowne Plaza. Dort läuft es super, ich arbeite 40 bis 45 Stunden pro Woche und verdiene gutes Geld. Meine Arbeitskollegen sind unglaublich nett, fast alle sind unter 25 und wir verstehen uns prächtig. Die meisten Duty Manager sind sogar jünger als ich. Ich habe außerdem mit dem Rauchen aufgehört. Etwas mehr als eine Woche habe ich es jetzt ohne eine Zigarette geschafft, in der Woche davor hatte ich vielleicht eine Schachtel über fünf, sechs Tage. Vor einem Monat habe ich noch eine ganze Packung am Tag geraucht. Jetzt komme ich ohne zurecht. Eigentlich war ich nicht unglücklich mit der Tatsache, dass ich Raucher war, aber man braucht eben manchmal einen triftigen Grund, einen “Ansporn”, mit der unnützen Sucht aufzuhören. Und den habe ich gefunden. Sie ist Australierin, 20 und natürlich Nichtraucherin. Begonnen hat es mit einer Anzeige in der Zeitung. Die ICH-Hotelgruppe sucht für ihre drei Hotels in Darwin für verschiedene Positionen, unter anderem Porter, Night Manager, Housekeeping und einige mehr, Bewerbungen bitte per eMail. Das habe ich umgehend versucht, in Anhang mein Curriculum Vitae. Ein paar eMails gingen hin und her, dann ein halbstündiges Telefoninterview und eine Einladun, vorbeizukommen. Erwartet hat mich im Crowne Plaza Darwin dann ein einstündiges Interview mit vielen psychologischen Fragen. Das Interview wurde durchgeführt vom Front Office Duty Manager und dem Nachwuchsspezialisten der Personalabteilung. Drei Tage später der Anruf, ich kann sofort anfangen. Am nächsten Tag war schon gleich mein erster Arbeitstag. Sieben Uhr morgens bitte, rasiert und gekämmt. Seit vergangenen Freitag bin ich jetzt also einer von drei Portern, oder “Concierges”. Wir haben unseren eigenen Desk, ganz am Eingang vom Hotel und wir stehen dem Gast mit Rat, und – vor allem – Tat, zur Seite. Der Gast möchte ein Taxi zum Flughafen gerufen bekommen, das Gepäck muss im Zimmer abgeholt werden, der Gast bekommt aufgrund seines Membership-Status eine Flasche Wein ins Zimmer geliefert, das gehört zum Job eines Porters. Doch die Hauptaufgabe besteht darin, die Autos, die vorne in der Einfahrt vom Gast stehen gelassen werden, im nahegelegenen Parkhaus zu parken. Man muss ganz hoch bis in den 4. und 5. Stock, wo unserem Hotel bestimmte Parkplätze zustehen. Das Auto wird geparkt, man vermerkt die Parkplatz-Nummer auf einem kleinen Handzettel und der Schlüssel landet hinter der Rezeption. Möchte der Gast sein Auto wiederhaben, muss er nur kurz bei der Rezeption anrufen und dann etwa 10 Minuten auf sein Auto warten. Das Autofahren ist ein wichtiger Bestandteil der Arbeit, auch wenn immer nur für kurze Strecken. Aber man hat das Glück so einige Modelle ausprobieren zu können. Am Montag war zum Beispiel auch ein neuer Toyota Aurion dabei, oder ein Holden Commodore mit V8-Motor. Und zur Krönung ein BMW X5, der in einem engen Parkhaus natürlich mit höchster Vorsicht chauffiert werden muss. Ich arbeite nicht von Montag bis Freitag, sondern meistens von Freitag bis Dienstag. Mein Wochenende findet dann am Mittwoch und Donnerstag statt. Sehr praktisch für Bank- und Behördengänge. Im Moment fange ich morgens um sieben an, und mein Job endet um halb vier nachmittags. Demnächst werde ich allerdings auch Spät- oder Nachtschichten arbeiten dürfen. Die Bezahlung ist die gleiche, aber natürlich hat eine Schicht von Mitternacht bis Morgens hinter der Rezeption auch ihren Reiz. Neben der finanziellen Bezahlung bekomme ich pro Schicht ein Mittagessen vom Buffet umsonst, das hat sicherlich alleine schon einen deutlichen Wert. Hinzu kommt ein ordentlicher Rabatt auf Essen und Getränke im Hotel-Restaurant und in der Bar, und erst recht auf Übernachtungen in allen Crowne Plaza’s, InterContinental Hotels, Holiday Inn’s und einige mehr, und zwar auf der ganzen Welt. Darwin ist mit etwa 120.000 Einwohner etwa so groß wie Pforzheim. Allerdings muss man berücksichtigen, dass im gesamten Bundesstaat “Northern Territory” nur etwa 225.000 Menschen leben. Das ist weniger als die Bevölkerung von Braunschweig. Mit etwas über 1,349 Millionen Quadratkilometern ist alleine Northern Territory viermal so groß wie Deutschland. Die Fläche, die in Northern Territroy jedem einzelnen Einwohner statistisch zur Verfügung steht, teilen sich in Deutschland mehr als 1.400 Menschen. Nur die vier größten Städte von Northern Territory haben mehr als 10.000 Einwohner. Selbst eine kleine deutsche Gemeinde wie Barsbüttel (ca. 13.000 Einwohner) bei Hamburg, wäre hier in Northern Territory somit die fünfgrößte Stadt. Wem Darwin mit 120.000 Einwohnern zu klein wird, der muss bis zur nächstgelegenen größeren Stadt eine ganze Weile fahren: etwa 2.600 Kilometer Richtung Osten. Das könnte man in zwei bis drei Tagen mit dem Auto schaffen. Wer lieber fliegen möchte bekommt ab etwa 100 Euro einen Flug nach Cairns – dieser dauert etwa zwei Stunden. Das “NT”, wie man das Northern Territory nennt, ist so groß wie Deutschland, Frankreich, Österreich, Tschechei, Belgien, die Niederlande, Dänemark und die Schweiz zusammen! Auf dieser Fläche leben in Europa mehr als 200 Millionen Menschen. Hier – wie gesagt – nur 220.000 Menschen. Das entspricht etwa 0,1 Prozent. Ich habe übrigens das Hostel gewechselt, und lebe jetzt näher im Stadtzentrum, ich habe außerdem ein Auto gekauft und seit drei Tagen einen richtig geilen Job als Porter/Concierge in einem Vier-Sterne-Hotel. Dort kann ich den ganzen Tag die neuesten Autos (test)fahren und muss ab und zu mal ein paar Koffer auf irgendwelche Zimmer bringen, zudem werden mir ca. 40 Stunden pro Woche garantiert und der Stundenlohn ist etwa das eineinhalbfache, wie das was ich zuletzt in Neuseeland im Restaurant verdient habe. Heute gab es für fünf Minuten Kofferschleppen sogar 20 Dollar Trinkgeld. Doch über mein neues Hostel, meinen neuen Job und mein neues Auto werde ich im März ganz ausführlich berichten. Das Wetter ist okay, es ist mit 28 Grad nicht zu warm und regnet ein paar mal am Tag. Liebe Grüße aus dem Norden Australiens!